Transportation from King Street Metro – If you are taking the metro to alexandria, it might be a bit of a walk from the King Street station to The Art League, but the free King Street Trolley, running every 10 minutes is an option. Here is information as of April 2018. Keep in mind it goes from the Metro station to the Torpedo Factory (The Art League’s main building) which still six blocks south of the Madison Annex , 305 Madison Street, where Rob teaches. More info on getting around Alexandria here. Here is a google map with nearby hotels and locations. 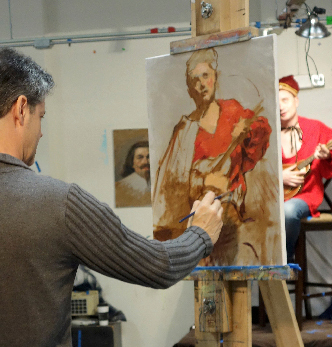 Rob teaches Friday classes and three workshops a year at The Art League of Virginia. Information about spring, summer and fall workshops are on the workshop page. WHERE – Rob’s Art League classes and workshops are held at: The Art League’s Madson Street Annex, 305 Madison Street, Alexandria, Virginia. QUESTIONS ABOUT CLASSES OR WORKSHOPS? Please see our FAQ page or contact the school directly at 703.683.2323 or go to www.theartleague.org. REGISTRATION – In the past, students signing up for Rob’s Friday classes have been camping out to be sure to get a spot in the class. (Registration in person takes presendent over registration online on The Art League website. Now his classes have been opened up to two adjacent classrooms (each with assistants) to allow a few more students to enroll. It seems to be working out well, so getting a spot should be easier. Contact The Art League for details. Rob is not involved in the regiatration process and does not know if a class or workshop is filled until the first day of class and, unfortunately, has no authority to prioritize students. Rob does not teach Friday classes during the summer. Fridays 10am – 3pm, Fall 2018, Winter 2019 and Spring 2019, nine classes each session, tuition $380. Please contact The Art League for more info. Fall: no class October 6 and October 20. Makeup class on December 1 and the second makeup will be determined. This class explores beautiful master drawing techniques and the artists who used them. Using both authentic and contemporary materials, students study artists from Michelangelo to Ingress, in order to develop a deeper understanding of the richness and power of their methods and materials. The Fall and Spring classes focus on red chalk, pencil and silverpoint, while the Winter class focuses on charcoal, pastel and watercolor. Any model fees are extra. Students need to purchase supplies for this class. A list of recommended supplies must be picked up from the School Store located in room 217 of the Torpedo Factory (see below). Fridays 3:30pm – 7:30pm, Fall 2018, Winter 2019 and Spring 2019, nine classes each session, tuition $310. Please contact the Art League for more info. Fall: Does not meet October 10 and make-up will be December 9. Winter: No class on January 20 or February 10, make-ups will be March 17 & 24. Intermediate/Advanced This class focuses on the two most important traditions in classical painting–Disegno and Colore. The first half of the term looks at the sculptural Tuscan approach of Disegno: a developed grisaille and subsequent layers of glazed paint. The second half of the term features the painterly Venetian practice of Colore which relies on direct application of paint. Students need to acquire supplies for this class. A list of recommended supplies is available in the School Store (see below). THE ART LEAGUE STORE – All supplies (except for the Silver Brush sets shown below) are easily found at 105 North Union Street, Alexandria, room 217, phone 703-548-8127. The Art League is non-profit and sells supplies at a discounted rate to Art League members and students. The store has Rob’s supply lists on hand, so you do not need to worry about bringing in your list. For store hours and information go to their website. Paint colors (oils): burnt umber, burnt sienna, cadmium yellow light, cadmium orange, cadmium red light, permanent rose, alizarin crimson,manganese violet, diozixine violet (also called Windsor violet), ultramarine blue, cerulean blue, phthalocyanine blue and green (optional), viridian, titanium white, lead white or lead white replacement (flake white). Rob likes Winsor & Newton oils, but any brand above student grade is fine. Medium: stand or linseed oil (or medium of choice), solvent such as turpenoid or gamsol. Canvas and Panels: between 9″x12″ and 18″x24″ toned mid-gray with acrylic paint. Centurian linen canvas or Ampersand gesso panels are good. You can tone them with white plus a little ivory black and a hint of burnt umber or use something like “Golden Heavy Bodied Neutral Gray N6” premixed acrylic. Canvas should be a neutral medium gray a little lighter than the bar at the left. Single sheets of fine quality drawing paper: Fall and Spring Classes use: Any good quality drawing paper that you like. Canson “Ingres” or “Mi-Teintes”(smooth side recommended) are good. Twinrocker “Yale” or “Calligraphy Cream” is ideal but more difficult to find. Paper should then be tinted using a watercolor wash (yellow ochre or raw sienna). After it dries apply a diluted layer of size (5 parts denatured alcohol to one part orange or amber shellac). This preparation will be demonstrated the first day of class. Winter and Summer Classes use: Canson paper, Twinrocker or Gutenberg laid for ink wash.
Small tubes of watercolor: (one or more tubes from the following colors) burnt sienna, burnt umber, raw umber, raw sienna, and yellow ochre. One tube of white designer’s gouache or watercolor. Silverpoint, which is a small length of 18 gauge silver rod, found at some jewelry stores and online. You only need about an inch to fit into the lead holder, but it is usually sold by the foot. Silver will be available in class if you cannot find it. The Art League store does not carry silverpoint materials.